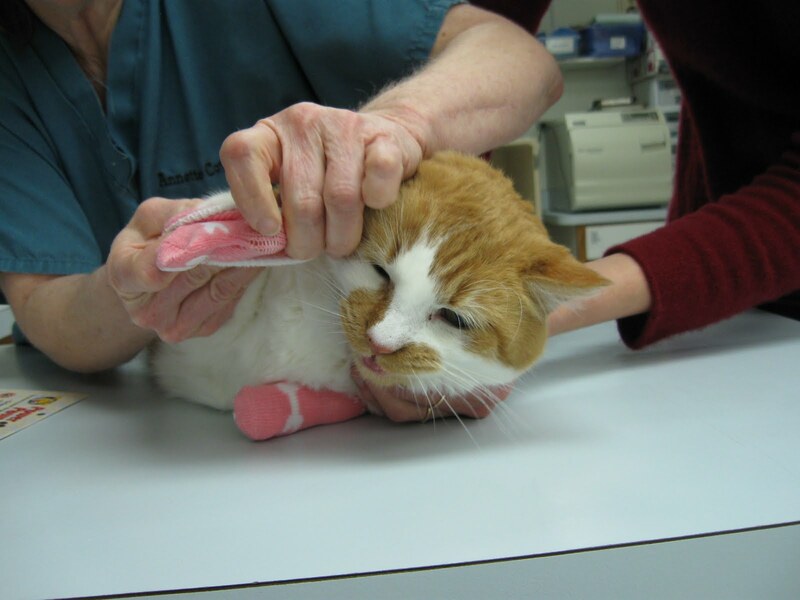 This is the story of Lazarus, a miracle cat, who came back from the dead to save the lives of other cats. Lazarus' beginning did not look very promising. 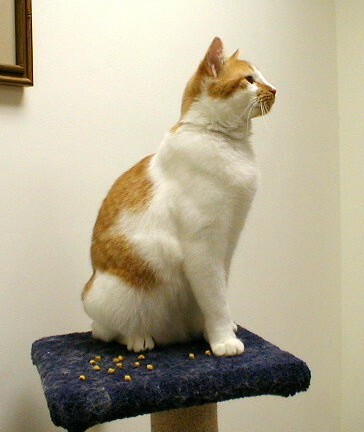 In 2001, a feral mama cat and her three kittens--including Lazarus, took up residence in Helene Lachance's yard. Lachance is a compassionate cat person and she was feeding the homeless cats and getting them to trust her. One night, Lachance heard some stray dogs barking and fighting. The next morning there was no sign of Lazarus and his family. She feared the worse. 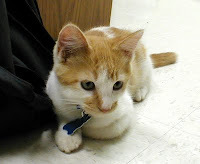 Then amazingly, a couple days later, a scraggly, undernourished orange and white kitten appeared on her back porch. It was Lazarus! He weighed little more than a pound. 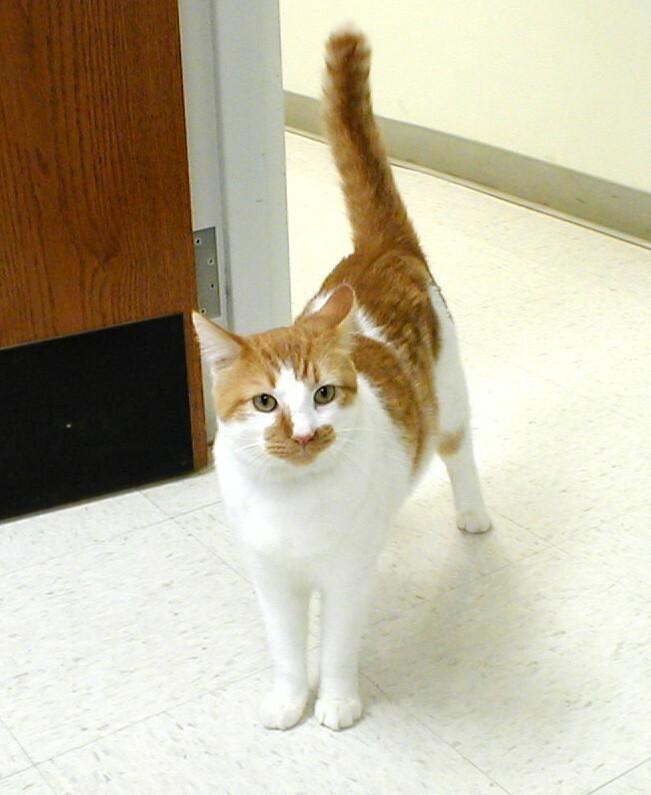 Lachance immediately brought him to The Cat Clinic of Stillwater in Oklahoma, where she had once worked. 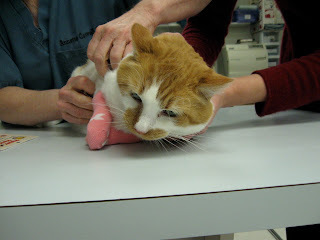 Lazarus' life was saved at the cat clinic. He thrived in his new, loving home. The little kitten who "rose" from the dead, like the Bible story, was named Lazarus and became a valuable staff member of the feline-exclusive clinic. "He is our blood donor in residence, first and foremost, "said Jessica Mayes, a nurse at the clinic. "When cats come in and we determine they need a transfusion, we cross match Laz's blood to theirs to see if it is a match." 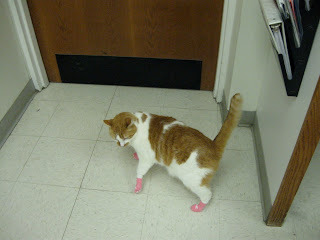 Numerous kitty patients who were severely ill are with us today because of Lazarus' work as a blood donor. For 10 years, he has given the gift of life to cats. Recently Lazarus gave new hope to an unspayed calico cat, named Missy. "She had a litter of kittens, but wasn't nursing them. She was lethargic and her third eyelids weren't retracting. Her lab work showed marked anemia and very low platelets. We gave IV fluids, but since her prognosis was guarded, we recommended a transfusion," said Mayes. "Laz turned out to be a match. 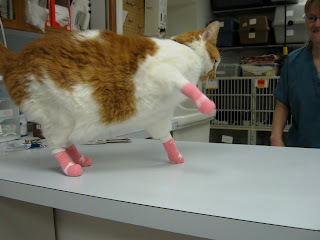 After receiving the transfusion, her condition improved and she was spayed the following week." Lazarus enjoys supervising the staff. Lazarus tests products for his bosses: Dr. Annette K. Cowell who started the clinic and Dr. Sarah Peakheart. 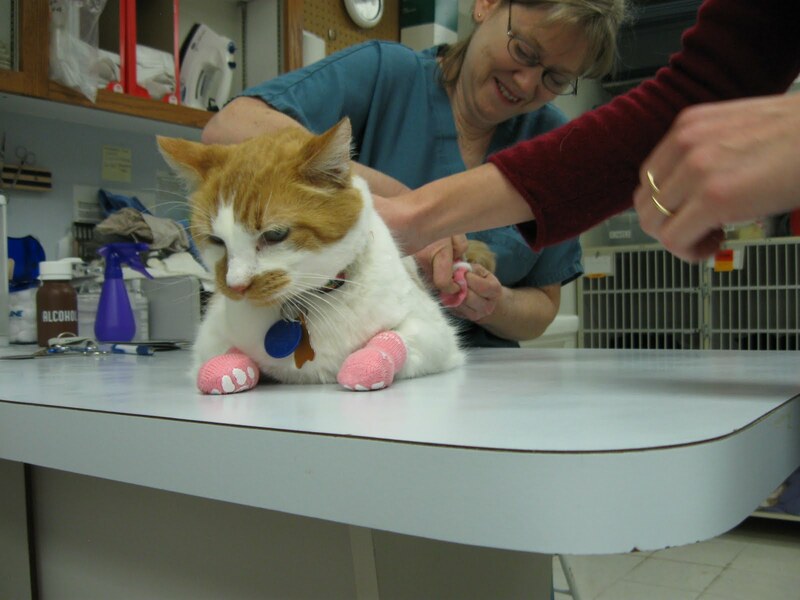 He tries out new toys, treats, and various cat accessories including these Power Paws cat booties that Dr. Cowell got from a conference. They are designed to help pets with mobility issues, or pets who just have a hard time on slick floors, move around better. and relax on the job. Don't you? Lazarus trains new nurses by letting them practice restraining him for venipuncture; giving him pills (with empty capsules), and other skills. 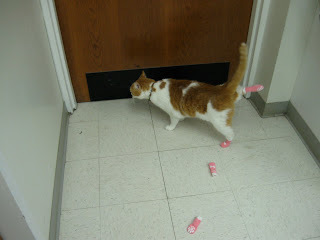 He also demonstrates pill administration to clients. Lazarus is the model for information sheets that the clinic's veterinarians provide patients. Lazarus is a very special cat who came back from the dead so that others might thrive. One of Laz's favorite places to hang out. 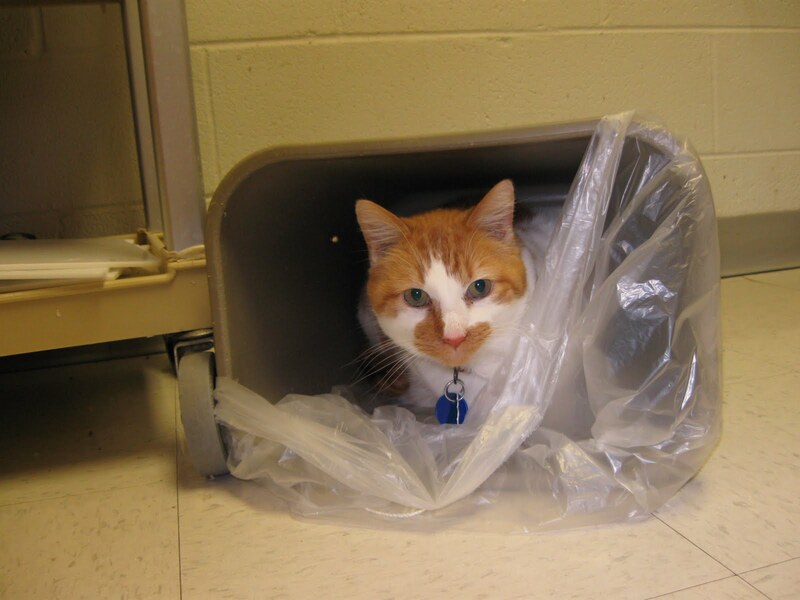 Lazarus is a feisty kitty who enjoys playtime on his days off. Oddly, he loves cat carriers and if we have one open, he will run inside it and just hang out in there until we either make him get out or he hears someone rattling the dry food. He likes to knock over trash cans and hide in them. We have to keep the bathroom door closed, or he will go in and dump the trash out or "investigate" the toilet. 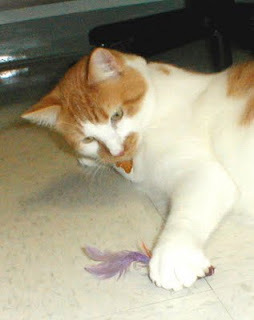 He has a toy that he loves, a pole with a squeaky mouse-type thing on a string, and he sometimes goes nuts over that. He also loves his catnip mice. Lazarus really likes Kitty Kaviar and the Cat-Man-Doo bonito flakes. Sometimes if I want to give him something extra-special, I put down a teaspoon or two of tuna for him. He prefers dry food to canned, but we mostly feed him canned food so we can control his weight. He loves the hypoallergenic pea and venison dry food, but he will come running for anything in kibble form. Lazarus has his own twitter account at ACatNamedLaz. He follows cats, dogs, animal rescue organizations, vet clinics, and most people who follow him, he will follow back. He also tweets about important vet or cat related info, including pet food recalls and various health topics. Some of his more "famous" twitter cat pals include TinyPearlCat, ShaynaCat, Crazy_Felix, and RosieandCheeto. 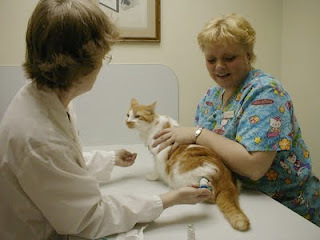 The Cat Clinic of Stillwater was designed with the cat in mind. 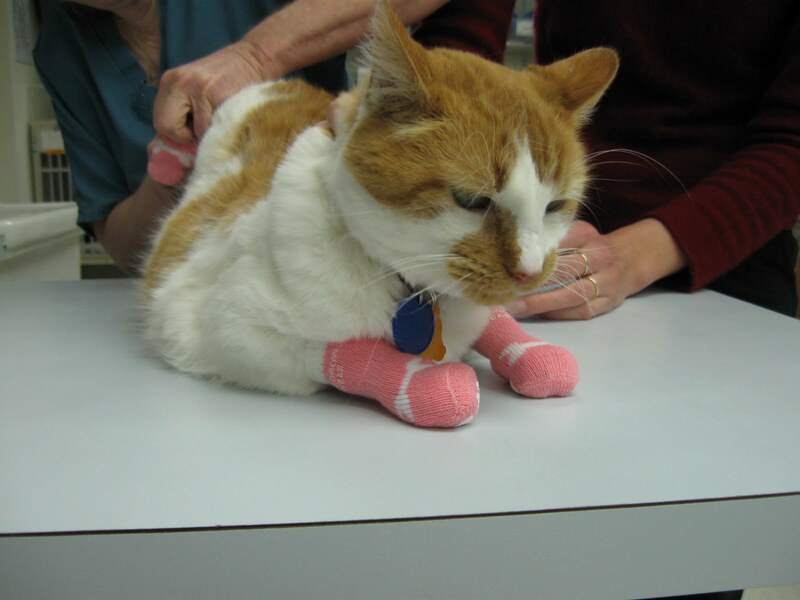 The building itself and all the equipment, medicines, and supplies are tailored specifically for felines. The clinic provide diagnostics, wellness and preventive care, surgery, dentistry, nutrition and behavioral counseling, radiology, and lab testing in-house. The doctors and staff are all cat lovers and have chosen to specialize in feline medicine and care. Lazarus is such a sweetheart! What an important and miraculous boy he is! What a great story! Lazarus surely knows he's a miracle puss! Thanks for introducing us to Lazarus! What a great story!! Keep up all the good work you do at the clinic, Laz!! 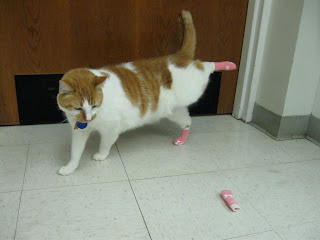 What a handsome, helpful and hero cat that Laz is fur sure! Wow, Lazarus, you sure sound like one wonderful kitty. We love you taking those shoes off. Good for you. We know you are one huge help at that clinic. The vet clinic where we go has two resident cats. We really enjoyed your story. Take care. Big Bad Baby Twinkle sez: "I usta be a Blud Donor too!! Now Iyam too old (15) to be wun, but I think You ROCK, Lazarus!!!" Lazarus was definitely meant to survive. He is a cat with a true purrpose. This post so touched me! I love his face. He looks like he has peanut butter smudged all over it lol. Thanks for giving us his twitter handle. I am now following him! So cool! Lazarus is pretty special :) It's funny, we know about dog blood donors but we never thought of kitty blood donors! What important werk he does! And he's so handsome. Mom wishes we had a local cats-only clinic to go to. What an amazing cat you are, Lazarus! Keep up the great (and important) work, handsome boy! Lazarus, keep your great work at the clinic and on your day off, have a lot of fun!! This is such a sweet story! Shout out to Lazarus ~ woot woot!